RasterEdge barcode generating control library for C#, which belongs to .NET Imaging SDK, is designed for C#.NET developers to create high-quality linear and 2d barcode images in .NET projects. More than 20 barcode types are supported including PLANET barcode. asp.net mvc excel viewer: ASP.NET Excel Viewer in C# Control (MVC & WebForms): view Office Excel document in web browser. The Postal Alpha Numeric Encoding Technique, i.e. PLANET barcode, is a linear bar code symbology used by United State Postal Service for mail identification and tracking. It can encode numeric data only with a length of 12 or 14 digits, including a mandatory checksum. Using RasterEdge .NET barcode writing control, users can easily create and draw PLANET with C# codings. You can easily generator PLANET barcode and save it to image files/object using this C#.NET barcode generator control. The following steps will show how to create a PLANET type barcode encoding numeric data text "01234567890" into the image object with XImage.Barcode.Creator. Please copy the sample code as follow to generator a PLANET barcode. .NET developers can use this barcode add-on component to create PLANET linear barcodes in C# projects. All the major raster image formats are supported for barcode generating, such as png, jpg, gif, and bmp. Users can create a single barcode or a number of bar codes on image file, and at the same time, you can freely define the exact area on the image where you want to put PLANET barcode. Demonstrated below is an example to write a PLANET postal bar code on a png image and save the image file to your local disk C.
Apart from printing PLANET 1D bar code on an image, users can also opt to generate PLANET barcode onto a single page within a document file, including PDF, Microsoft Office Word, (multi-page) TIFF, Excel and PowerPoint. You can control the accurate barcode location on the page by setting x and y coordinates using Visual C# programming language. 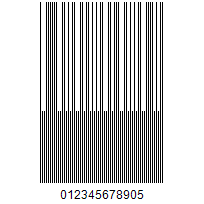 Here is the sample code for creating and customizing PLANET barcode with parameters listed above. Please feel free to make any modification according to your C# imaging program requirements.